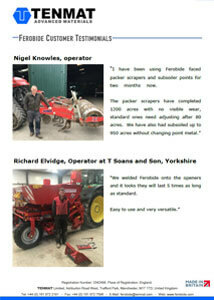 TENMAT initially developed innovative FEROBIDE wear protection over 8 years ago to resolve the major limitations of traditional tungsten carbide materials often used on Agricultural Machinery Points. FEROBIDE has experienced successful development at TENMAT’s in-house R&D technical laboratory alongside positive field testing across all types of soil and machinery application under challenging working conditions. Unlike traditional tungsten carbide, FEROBIDE uses a steel matrix to bond tungsten particles together. The unique forming process yields very high wear resistance combined with a superior impact and chipping resistance. 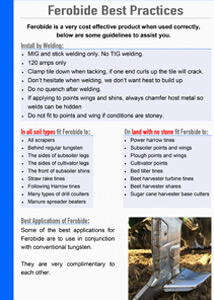 FEROBIDE consists of high-quality tungsten carbide, with a typical hardness of 1500 HV. 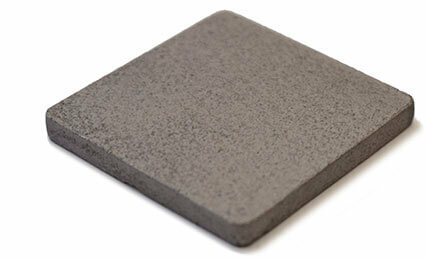 This durable tungsten carbide composite offers superior resistance against abrasion and impact. Through third party testing in UK lime quarries, over 50 hours of continuous ground engagement, FEROBIDE exhibits a resistance to impact 63% better than high quality tungsten carbide. FEROBIDE couples this with a resistance to abrasion 8 times better than 500HB boron steels, 4 times better than chromium carbide hard-face overlay plates, and more than 3 times better than white cast iron. 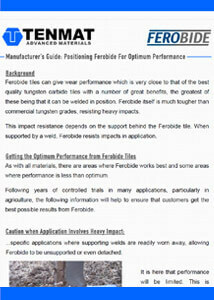 FEROBIDE exhibits a resistance to abrasion which is comparable to commercial tungsten carbide. Alongside its superior mechanical properties, FEROBIDE distinguishes itself through its quick and easy installation. FEROBIDE is welded directly onto wearing parts, onto positions as determined by the user. This puts full control into the hands of the welder, and allows for components to be protected exactly where needed. Being fully customisable, FEROBIDE is cut to shape with ease. 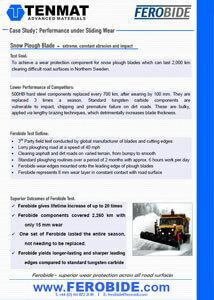 This, combined with superior toughness, makes FEROBIDE the ideal choice for high impact and high abrasion situations. By using FEROBIDE wear protection, customers can significantly increase the working life of wearing parts, avoid lengthy downtime, and boost productivity. All 4 mm thick tile sizes are normally available from stock, ready for despatch. 6 mm and 8 mm thick tiles offer an higher resistance to impact and chipping. 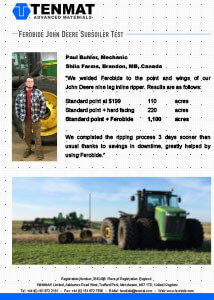 They answer the need for wear protection in higher impact applications. Best suited for leading edges and points subject to extreme forces.